We used the recipe for "Seafood Ceviche, Nobu Style" from Nobu the Cookbook. 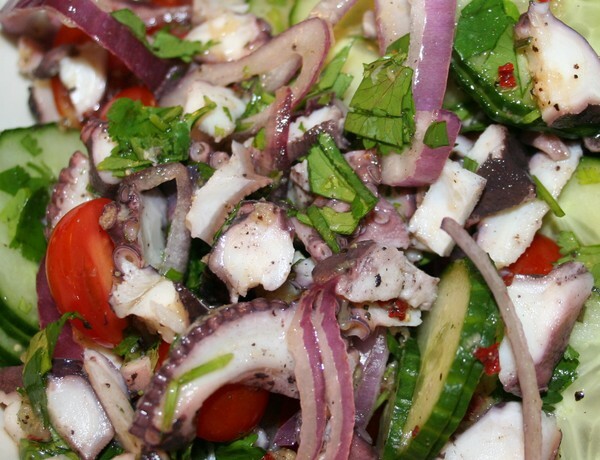 You don't have to use only octopus - you can use it in combination with other fish or shellfish, or not at all. But we had that whole octopus, so that's what we went with. Ceviche is basically seafood and citrus in combination with other salad elements - onions, tomatoes, herbs, etc. But the citrus is important - it's what cures or cooks any raw seafood you might be using, and it's also bright and refreshing. This is a great summer dish. There are two components to this dish - the dressing, and the salad ingredients. Here's how you make the dressing. Nobu's words are in bold, my notes are in italics. Yield: 5 Tablespoons and 1 tsp. Pretty simple, right? Let me tell you - it's a bright, intense, delicious powerhouse of a sauce. Mix all the seafood and vegetables together well. Combine with Ceviche Sauce and transfer to a serving dish. Top with a cilantro sprig. And that's all you do. We made it this evening after the kids' swim class and I think, working together, Bill and I had it done in less than fifteen minutes. We did a less intense version for the kids, because they wanted octopus and I thought the Ceviche sauce would be too spicy for them. I was wrong. They both ate the less spicy version Bill put together, and then wanted more octopus. They were told that all we had left was the spicier stuff - didn't matter. Alex ate some of the octopus in the ceviche, and Julia went all out and had a piece of the red onion, too. And they liked it. Which is why we keep telling them - all we ask is that you TRY it. So go ahead - you try it, too!